Simple, home-use rehabilitation kit designed to aid in regaining shoulder range of motion and strength. Portable, lightweight and compact. Comes with graduated resistance tubing, collapsible bar and pulley rehab aids. Includes exercise booklet with customizable exercise protocol. No assembly required. 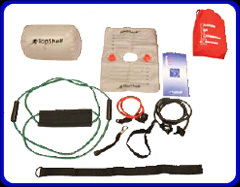 Complete exercise kit for regaining strength and motion to the knee. 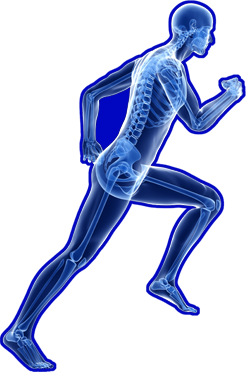 Exercise booklet categorizes exercises under 4 key areas: range of motion, stretching, strengthening and functional training. Contains air pillow, weight bag, door adapter, resistive tubing, ankle strap, squat tubing, and stretching strap. 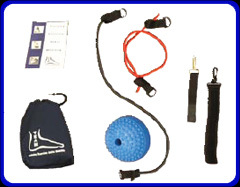 Portable and compact exercise kit for post-operative ankle rehabilitation. 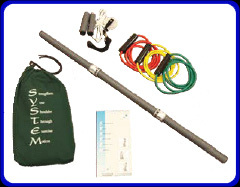 Contains resistive tubing, balance sphere, ankle strap, door adapter, and exercise booklet. 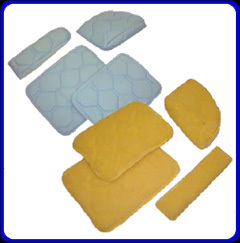 Comfortable and durable soft goods kits for use with continuous passive motion (CPM) knee machines. Includes thigh and calf pads, foot bootie pad and thigh strap. Hook & loop contact closure. Choice of quilted sheepskin or Dri-Q® moisture wicking material. *Actual CPM product size and color may vary from photo depending upon CPM pad kit chosen. 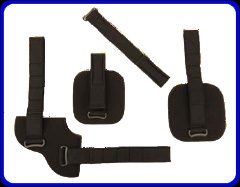 Additional strap for Knee CPM machine soft goods kits. Contains hook & loop contact closure. Made with soft sheepskin. Comfortable and durable soft goods kits for use with continuous passive motion (CPM) shoulder machines. Includes all necessary pads and straps. Hook and loop contact closure allows for easy application and adjustment. The ProtectOR is designed to aid in the prevention of injury due to impact or falls following a trans-tibial amputation. It is adjustable in size range to accommodate an individual’s anatomy for both the left or right limb. It has been designed to be comfortable and adaptable to a patient’s leg with a removable and washable liner. Wearing the ProtectOR will aide in the prevention of flexion contractures and provide a safety barrier over the surgical site when ambulating or transferring from the bed, chair or commode. It allows for easy access and attention to the surgical dressing for visual inspection and changing. No assembly is required once fitted by a practitioner (Circumference can be altered within each size range for 2” of diameter difference). 520103 The ProtectOR Small 15.0" - 17.0"
520104 The ProtectOR Medium 17.5" - 19.5"
520105 The ProtectOR Large 20.0" - 22.0"
520106 The ProtectOR X-Large 22.5" - 24.5"
Lighter than wood, the standard aluminum crutch provides stability and durability. Pushpin adjustment makes it easy to adjust crutch height in 1" increments. Non-skid, jumbo-size vinyl contoured tips provide excellent traction. Easy wing nut adjustments for hand grips. Comfortable, durable accessories are latex free. 300 lb. Weight Capacity on aluminum crutch (excluding pediatric).